Malabo Equitorial Guinea: HD SNG uplink transmission from Globecast. 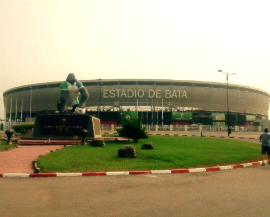 Paris, February 2015 — Globecast has announced that it has risen to the considerable challenges of this year’s Orange Africa Cup of Nations, EQUATORIAL GUINEA 2015, football tournament, proving a variety of successful contribution and distribution services that helped bring the tournament to screens around the world. Globecast gathered a highly experienced team from its staff and began the process of configuring and shipping seven HD flyaway uplink kits – there was a total of 4.5 tons of equipment – then had to organise local logistics and seven different satellites for contribution and distribution. The situation was made more complex by the fact that the capital of the country – Malabo, to where all the equipment had to be shipped – is a 45-min flight from the mainland. 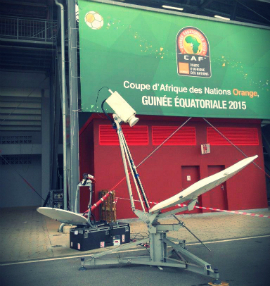 Globecast supplied uplinks and contribution – main and backup feeds – from the four stadium locations for its customer, to sports marketing agency SPORTFIVE AFRICA. Distribution was global to 51 broadcasters, with Globecast supplying a field team of engineers and a coordination manager in Africa as well as a MCR in Paris with a dedicated engineer and coordinator for each match. There was also a supervisor for worldwide distribution plus remote live monitoring for each downlink on every satellite. Additional French commentary was added in the Paris MCR, giving a total of eight language broadcasts.